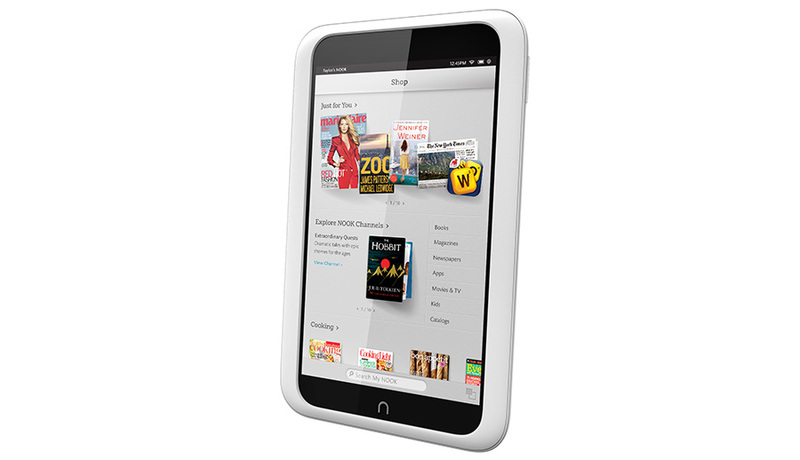 Barnes & Noble, Inc. (NYSE: BKS), the leading retailer of content, digital media and educational products, today introduced NOOK HD and NOOK HD+, the lightest HD and full HD tablets. The super-fast and lightweight 7-inch NOOK HD and 9-inch NOOK HD+ feature must-see displays for superior reading and entertainment and an instantly personalized tablet experience for each family member. In fact, NOOK HD boasts the world’s highest-resolution ever on a 7-inch tablet and NOOK HD+ rivals the industry-leading tablet’s display. Starting at the low prices of $199 for NOOK HD and $269 for NOOK HD+, nearly half the cost of the leading large-format tablet, both products deliver an amazing value for customers, with no annoying ads. With more than three million books, a large selection of magazines and apps, and now with newly launched NOOK Video™ and NOOK Catalog™ content, NOOK HD and NOOK HD+ offer virtually endless reading and entertainment at customers’ fingertips. Both are available for pre-order at www.nook.com and Barnes & Noble stores for customers to enjoy beginning in early November. In a world of jittery Android-forked sub-$200 tablets, I continue to root for Barnes & Noble. Despite being woefully outgunned by the likes of Amazon and Google, Barnes & Noble has today released a very compelling, attractive, and robust refresh of its Nook tablet line. Boasting laminated glass to combat glare, a thoughtful design, a high pixel density display, and a soft touch back for comfortable one-handed grip, the Nook HD, particularly, looks to be a well-considered response to the latest Kindle Fire updates and the Nexus 7. Moreover, somewhat stunningly, the new Nook line is priced lower than the latest Kindle Fire upgrades, despite the fact that the Nook tablets are ad-free and come with a full complement of cables and adapters. Now that Barnes & Noble is steadily expanding availability into the United Kingdom and Europe, I cannot shake a distinct feeling of admiration for the retailer. Faced with overwhelming opposition from its contemporary competitors, Barnes & Noble has wasted no time in the rapid disruption of its own business model. In an age characterized by the rapid obsolescence of brick and mortar retailers, Barnes & Noble's scrappy fight for relevance is utterly deserving of praise. I've owned several Nook e-readers over the past few years, and, beyond some jittery software issues, the devices were a pleasure to use. Although I've since become reliant upon Amazon for my e-reading needs, I persist to hold some sort of romantic hope for the long-term success of Barnes & Noble, regardless of how unrealistic such a hope may be. The devices are scheduled to go on sale in late-October and early-November. In the meantime, The Verge has a fantastic hands-on overview of the new Nook tablet line.